Old-growth clearcutting on the Willamette National Forest. Photo by Cascadia Wildlands. The Cascadia Bioregion is the lush, forested region extending from northern California to southcentral Alaska. Cascadia Wildlands works within this bioregion (and the U.S.) where immediate threats to wild places are highest. Currently, these places are Oregon and southeast Alaska. Decades of aggressive clearcutting have destroyed more than 80% of the original old-growth forests that once blanketed the Northwest. And year after year, our government plans and subsidizes public forest destruction for the profit of private timber companies. 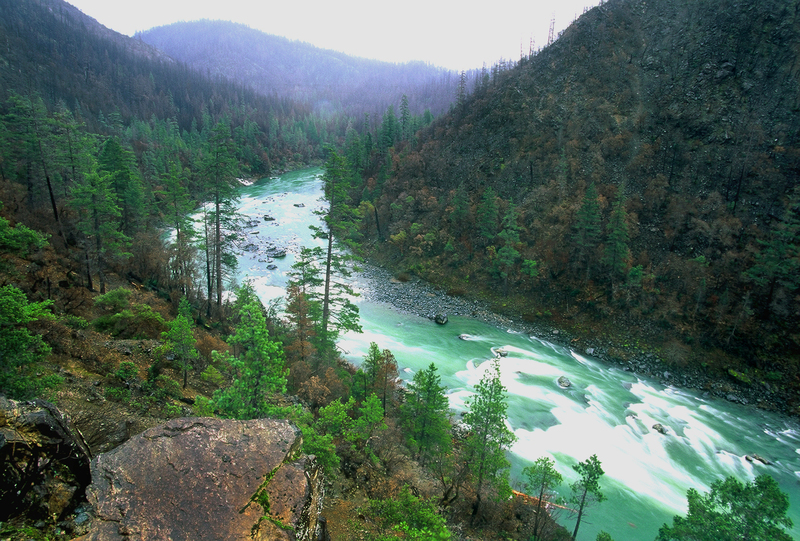 Cascadia Wildlands uses a combination of education, organizing, outreach, agitation, litigation, advocacy, and collaboration to defend wild places and promote sustainable, restoration-based forestry. We focus on specific projects and campaigns that achieve tangible, on-the-ground results. 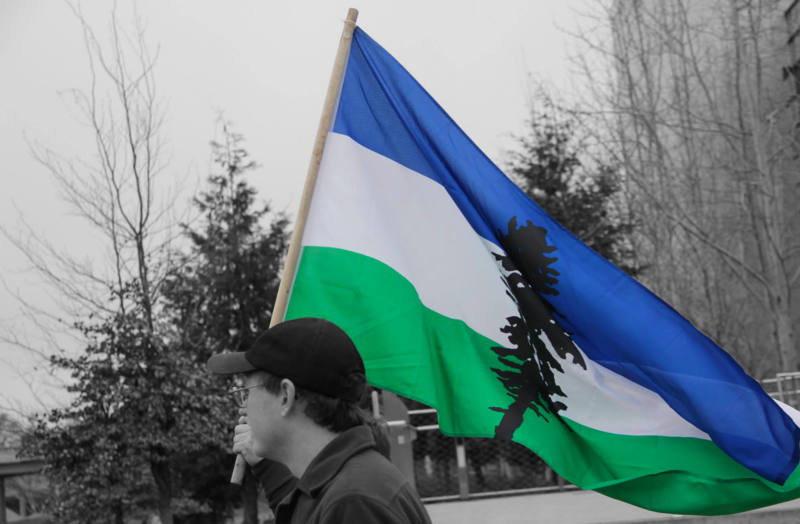 When it comes to protecting Cascadia, we deliver. Bunchgrass Ridge, Willamette National Forest. Photo by Brett Cole. 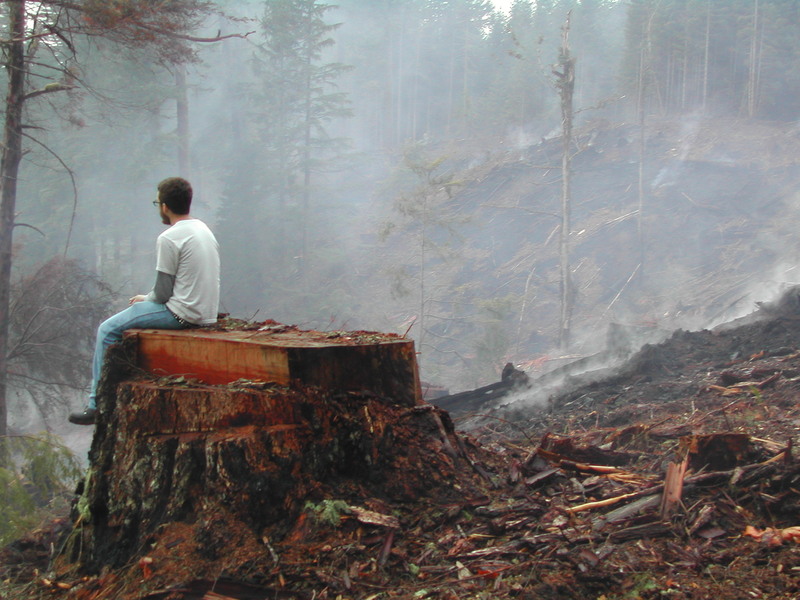 The formation of Cascadia Wildlands in 1998 was catalyzed by the lawless practice of clearcutting temperate ancient forests authorized by the Salvage Rider. 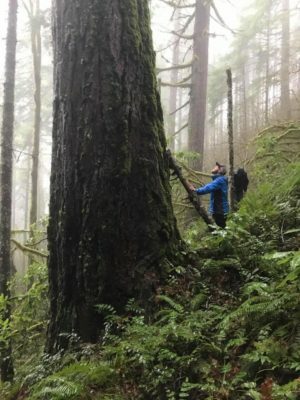 As a result of this and continuing threats in this arena, we devote much of our efforts towards protecting old forests as they are critical to the survival of species teetering on the brink of extinction, including the marbled murrelet and northern spotted owl. 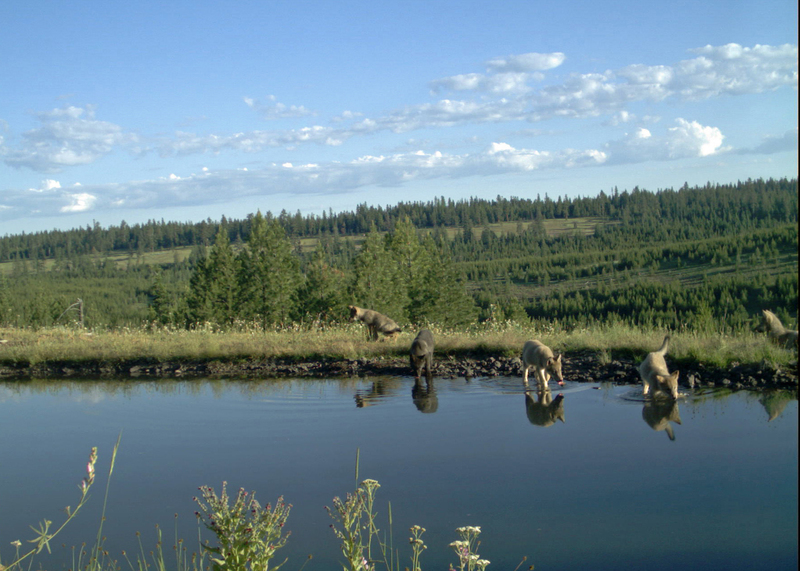 Imnaha pack pups 2013 (photo by ODFW). 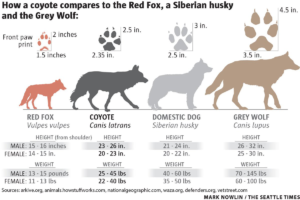 Through trapping, poisoning and shooting, government agents and bounty hunters killed off every last gray wolf in Oregon, Washington and California by the 1940s. However, the species has begun to make a remarkable comeback in the Pacific West as wolves have migrated west after a successful re-introduction into the northern Rockies in the mid-1990s. Today, approximately 137 individuals and 16 packs or alpha pairs now call Oregon home. Similar numbers have been restored into Washington, with 124 individuals and 22 packs. In 2015, an alpha pair had pups in California for the first time in nearly a century. Today, California has an estimated count of 6 individuals and 1 pack in residence. Misinformation, fear mongering, poaching and lethal control continue to confront gray wolves as they mount their historic comeback in the Pacific West. Cascadia Wildlands and allies are working tirelessly to protect and restore a viable population of wolves across the Northwest through advocacy, outreach, education and litigation. We are also a founding member and sit on the steering committee of the Pacific Wolf Coalition, which was formed in 2012 to promote gray wolf recovery in the Pacific West. 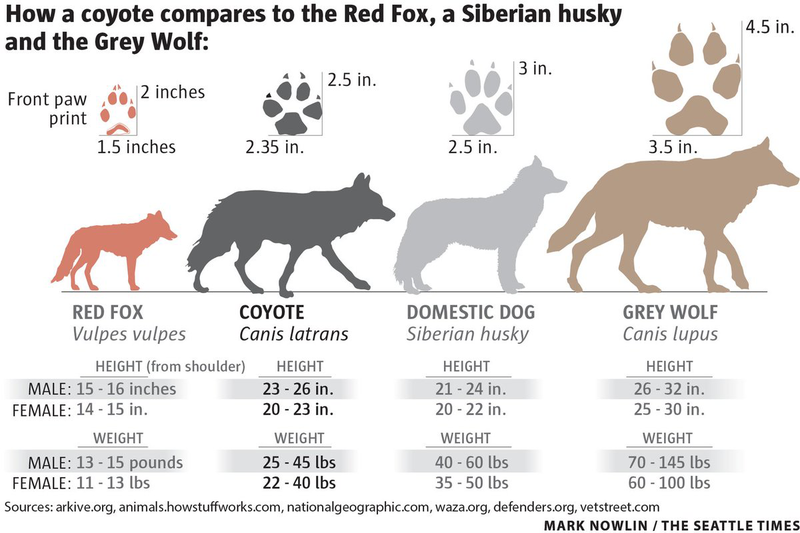 Click here for more information and resources on gray wolf recovery. 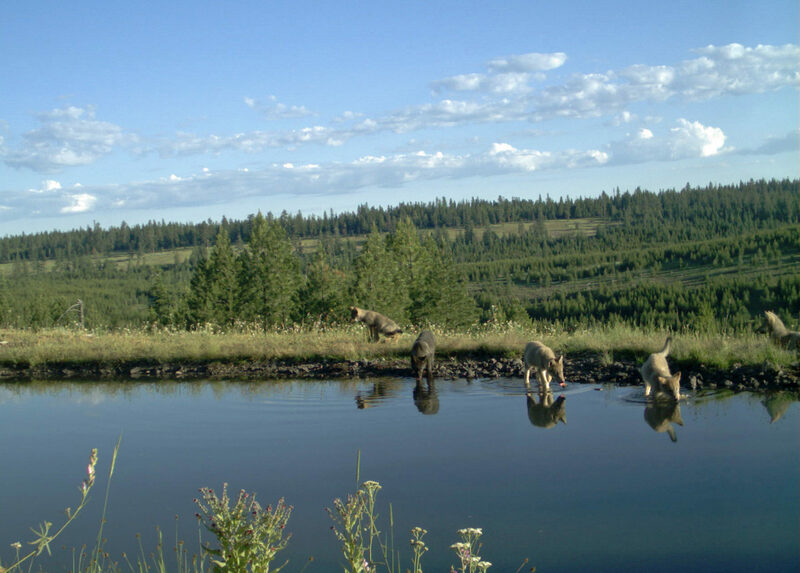 Visit our chronology of Oregon wolf recovery since 2008. Maintaining federal wolf protections — currently under threat! Spawning salmon. Photo by USFWS. Cascadia is a bioregion defined by the northeastern Pacific Ocean and the associated watersheds. Those watersheds are filled with rivers, creeks and rivulets and many of those waterways were filled with salmon and steelhead. So salmon—in a very real sense—once defined the place we live in and love. If we continue to squander this precious resource and lose our wild salmon, what does that say about us? We feel strongly that we cannot let that happenstance occur and therefore must restore and protect our wild salmon heritage. Climate change is currently the greatest and most formidable threat that we face as a planet. The science supporting climate change is conclusive and repeatedly borne out by myriad weather anomalies and arctic ice patterns, as well as biological phenomenon such as altered timing of migrations and species’ distributions. Cascadia Wildlands recognizes the immediate need to take action to lower atmospheric greenhouse gases and bring the climate back to a stable condition. We take a two-pronged approach to combating climate change, which includes both halting the fossil fuel industry’s emissions of greenhouse gasses, and defending Cascadia’s forests, which are some of the best in the world for storing carbon. 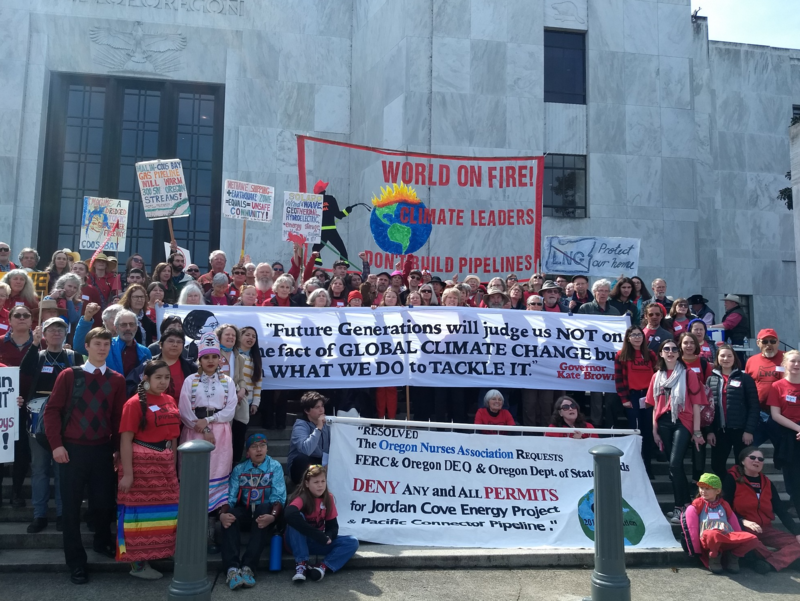 The Jordan Cove Energy Project: The Jordan Cove Energy Project, which includes the Pacific Connector Pipeline and fracked liquefied natural gas (LNG) export facility is currently the greatest threat to our climate security in the region. The Jordan Cove Energy Project is now a plan by Pembina, a Canadian energy company, to export fracked liquefied natural gas (LNG) from Canada and the Rockies overseas using Oregon as a right-of-way. 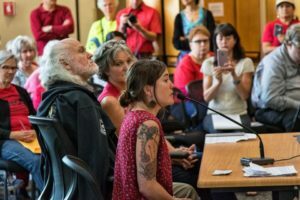 If built, this 229-mile fracked Gas Pipeline and associated LNG Export Facility would threaten 485 waterways (including the drinking water for over 116,000 Oregonians), seize property from private landowners through eminent domain, create major safety and public health hazards, impact Tribal territories, cultural resources, and burial grounds, and become the largest source of climate pollution in the state. We continue to fight this project tooth and nail and won’t stop until the proposal dies once and for all. Learn more here. Healthy forests have an incredible capacity for storing carbon, and the forests of western Cascadia are some of the best in the world for carbon sequestration. 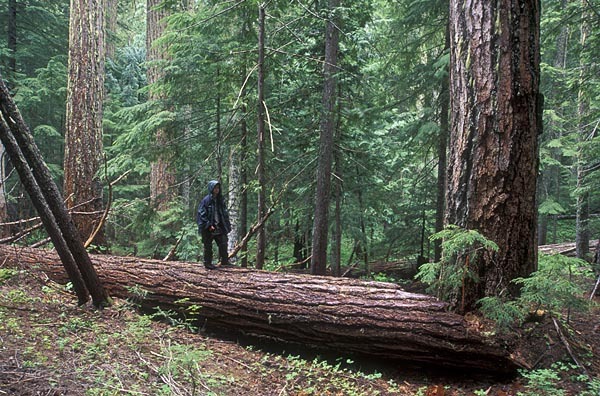 In fact, the Oregon Global Warming Commission’s Forest Carbon Task Force found that each year, Oregon forests take in between 23 and 63-million tons of carbon dioxide, making them unmatched in their ability to store carbon. Unfortunately, Cascadia is also home to an aggressive logging industry that often disregards the incredible capacity of our forests. Aggressive timber management and clearcut-plantation logging practices not only undercut the ability for Cascadia’s forests to store carbon, but also contribute hugely to greenhouse gas emissions. Indeed, the timber industry is Oregon’s biggest climate polluter. Defending Cascadia’s forests, such as the remarkable Elliott State Forest, is essential work toward combating climate change and supporting natural processes of bringing atmospheric carbon levels back to stable quantities. 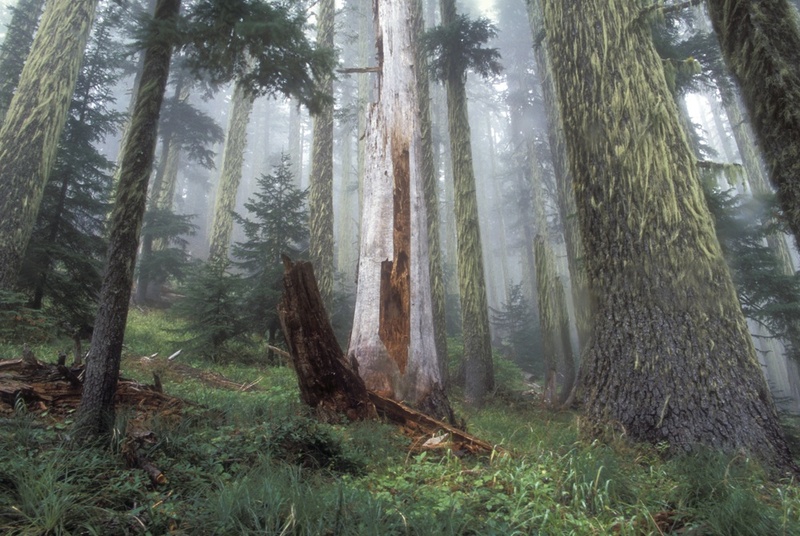 Click here to learn more about our work defending Cascadia’s forests. It is not an overstatement to say that if we are successful in all that we do here at Cascadia Wildlands and we fail to stem human-caused climate change in a material way that we will lose much that we have gained and possibly more. 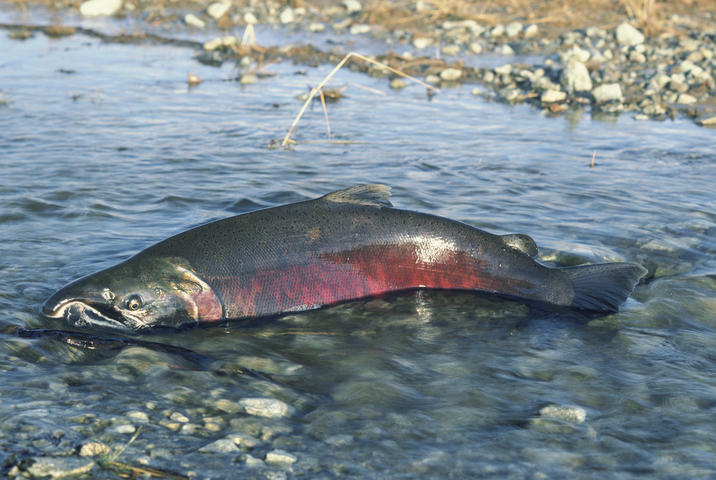 The Loss of Pacific Salmon Runs—Warmer waters and reduced snow packs will very likely act together to eliminate migratory salmon and steelhead runs and some resident trout populations. Salmon and steelhead will often not cross stretches of water that are too warm (known as thermal dams) and reduced water volumes will likely block fish transit to and from the ocean at critical times. Large Scale Forest Change—We are currently beginning to see climate-driven changes in Northwest forests. For example, lodgepole pine populations are being stressed and reduced by bark beetle infestations that may be facilitated by warmer temperatures. Other species of trees and plants will see range reductions or shifts that could have both biological and economic consequences. Experts also point to climate change creating conditions ripe for larger and more severe wildfires in the West as we have seen in recent years. Ocean Acidification—As CO2 levels increase in the atmosphere they also increase in the ocean along with nitrogen and sulfur compounds associated with the burning of coal and other fossil fuels. All of these added chemicals act in concert to increase acidification of the ocean and our coastal waters. Elements of the shell fishing industry in the Pacific Northwest are already seeing retarded shell growth and other fin fisheries will be impacted as the effects move up the food web. Agriculture—Climate change deniers have often argued that increasing CO2 levels will only benefit agriculture by increasing growth rates and therefore production. But experience is showing us that the associated heat, droughts, and storm intensities are having a negative impact on crop growth. What’s more, associated acid precipitation may leach nutrients and needed trace minerals faster from soils increasing the need for more costly agricultural input.